On my travels I’ve come across a lot of public displays of Christmas. I’m pretty sure there wasn’t much of this when I was a kid, but now it seems like every other house has some sort of decoration outside of it. A dummy Santa flails in the wind on every street. Lights twinkle, flash, falter. Some of the displays are rather tasteful, others lean towards kitsch, others are plain gaudy, others still are just odd. 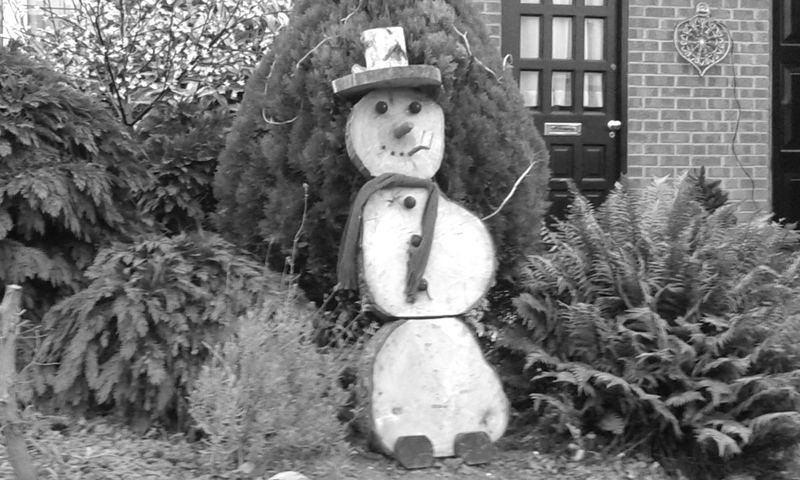 But this is my favourite display, a snowman made out of wood. The photo is unfortunately a little blurry, but I’d been loitering outside his owner’s house for long enough. It is an odd change in society, the need to celebrate the festive period by climbing up the outside of one’s house, risking a trip to A&E, and cover it with lights. My daughter & I have a Christmas tradition of driving around to look at them. This year while there weren’t many more OTT ones the volume of houses with a few lights seems to have grown dramatically – more so in suburbia rather than the less leafy Lewisham though. It is a weird new tradition, isn’t it? I like taking a look at them but I do wonder about the motivation for doing it and the electricity bills too! I’ve noticed certain roads have much more going on than others, so I suspect there is sometimes some sort of social pressure to take part in the spectacle, and no doubt some one-upmanship, which just perpetuates the whole thing.